Two rolls of Catalan flags stand in the window of Gloria Clopés’ haberdashery store in the town of Arenys de Munt, 45km from Barcelona. When a mass rally for Catalan independence was held in Barcelona last month the difference hardly mattered. “People here were desperate to buy either,” she says. Tucked inland away from the ribbon development of the Catalan coast, Arenys de Munt is remarkable for its riera – the sand-strewn main street that doubles up as a flood channel, draining the steep wooded hills around. Nearly every one of the elegant, modernista facades along the street sports a Catalan flag. This is hardly surprising: for like the water that pours through it in torrents after the autumn rains, Arenys was where the recent Catalan nationalist deluge started. 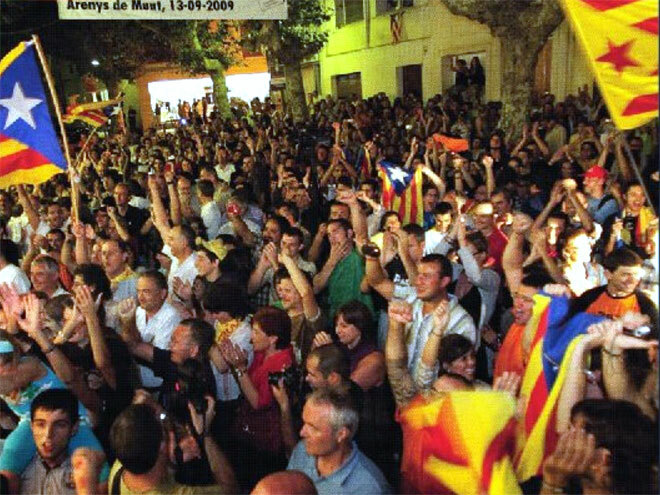 Here, three years ago, local nationalists held the first of a series of informal, local plebiscites on independence that led inexorably to last month’s million-plus rally in Barcelona, an event that has turned Spanish politics on its head.